Toymunkey Studios has revealed its glorious Red Pyramid Thing figure in full paint. Revealed at San Diego Comic-Con, Toymunkey’s Silent Hill figures have given collectors and fans hope once more in finding well made statues from the foggy town of Silent Hill. 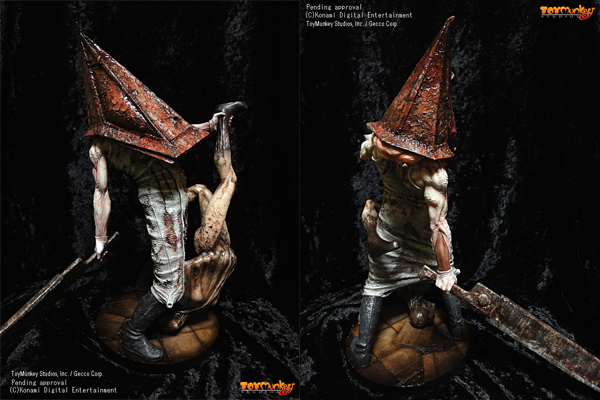 Konami Style released their own Pyramid Head (and Valtiel) figures a few years ago, but professional statue collectors and painters heavily disliked the paint job. Toymunkey’s figures have been getting some well deserved props from my more artistic friends. The paint job and detail on Pyramid Head’s dome is amazing. The paint looks worn, flaked, and beautifully decayed. I’m no expert when it comes to these things, but the figure looks great. As a friend pointed out, PH’s smock may be a little too gray, but every other part of the figure makes up for it. Toymunkey says that the design is still pending approval and need to be approved by licencors. If this figure somehow gets any better, I’ll be sure to write about it. The best part about all of this is that Toymunkey has stated that the figures will be around the $150 range. That is significantly cheaper than the poorly painted Konami Style figures. I know what I want in my Christmas sock this year: Scary things!